One of the few things my father left as a legacy was the love of running. I can’t remember what age we were made to start running but I remember being in middle school. 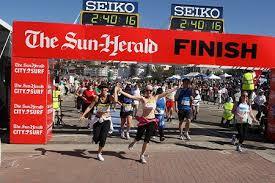 I never entered competitions except for the Round The Bays in 1983, just after my father died. I’m not a fast runner, now I do what I call a ‘granny shuffle’. But I do like to run. At 46 though, the body doesn’t quite bounce back like it used to. We’ve lived in Kenya since 2012 and I pretty much decided that running would go on the back burner. While we lived in Sydney I could jog along the streets and then the beach, it was great. I entered the City to Surf, the biggest funrun in the world where 80,000 people run the 14km trek up Heartbreak Hill to Bondi Beach. I ran it years ago. My finish wasn’t so enthusiastic. Nairobi is a little (okay a lot) different to run in. I can’t go for a run before 6.45am as it’s just getting light. At that time of the morning there are footpaths full of people making their way to work. There’s no ‘keeping to the left’ you just have to squeeze in between the crowds. I actually like to go later when there’s less people but it’s way too hot. One of the biggest obstacles for safely running here is the footpaths, or lack of them. Around where we live there are a few footpaths but they have holes in them or are broken up in places. When you’re running you kind of feel like you’re in a cross country event. About 200 metres from our place you turn a corner to go down and up a hill. You would have to be insane to try and even run over that spot. A few times I’ve nearly twisted my ankle on loose rocks. And then there are the trucks. I don’t know what it is about trucks here but they are way overloaded and go slower than a snail up hill. They puff out this thick, dark smoke that doesn’t go in the air but out at face level. It’s gross. This photo doesn’t even show how bad the smoke from the trucks are. So for the first few years I didn’t bother running. I set up a home gym area but once you get up to 100 squats, situps, pushups and the like, what’s next? 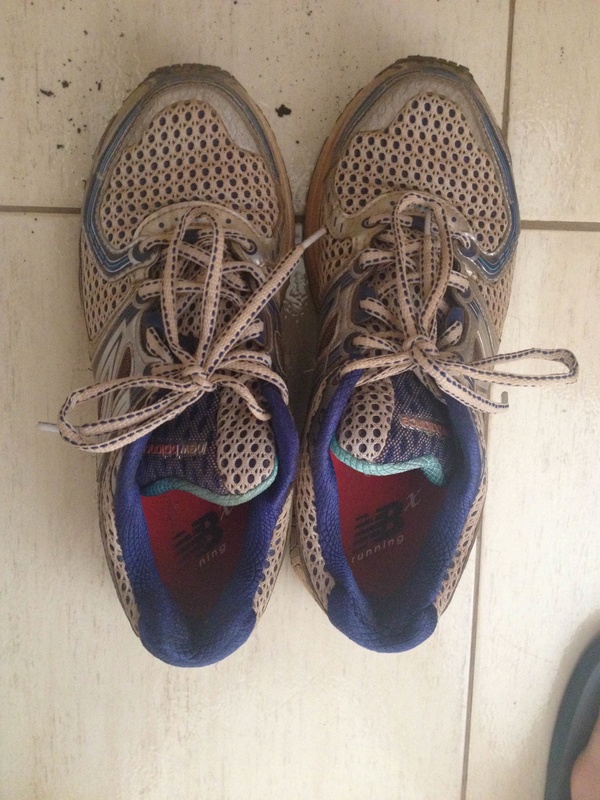 We returned back from our overseas trip a month ago and I decided ‘what the heck, why not give running another go’. So I have. I’m only a couple of weeks into it, and amping up the anti to see if my foot can handle a run three times a week. I’ve a Morton’s Neuroma under my right foot which plays up whenever it feels like it. It’s like having a hot, sharp poker up through your foot. 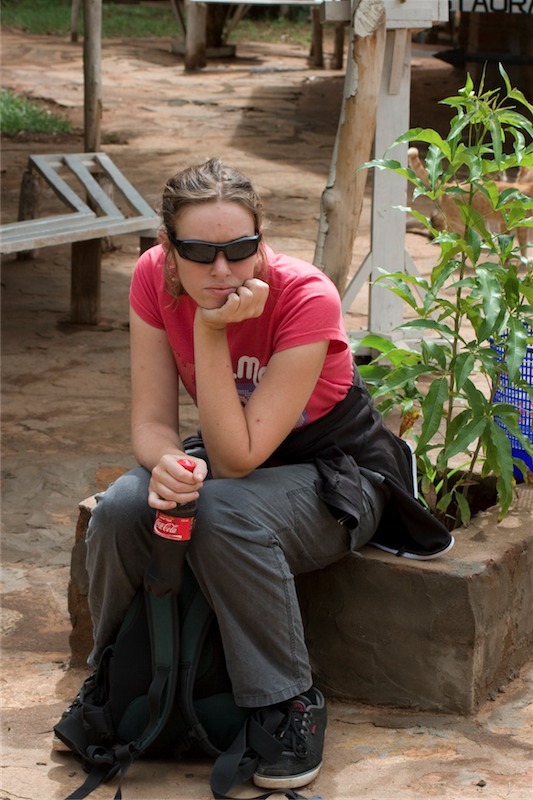 In 2011 and 2012 I climbed Mt Kilimanjaro in Tanzania. In 2012 the last day was excruciating because my foot played up so much. I just couldn’t wait to get down. On March 8th, Lizzie and I will be running 10km’s in ‘The First Lady’s Half Marathon’ around Nairobi. I really want to get up to a half marathon status but not sure if my foot would make it. One of my dreams is to run in the Lewa Marathon through an animal conservancy. Here’s hoping I can do it by next year. I run because I like getting out there with my headphones on and not worry about all of the world’s problems. I need to run to keep myself fit. When I run I drink a lot more water than if I sit in front of a computer all day. I run because I can’t afford to go to a gym. And I run because I like it. I always get amazed on what draws people to come to Kenya to work or volunteer. Everyone has a story and I try and get them to tell me. Some come to escape from their former life. Others to get themselves up the ladder of success in business. Some found that this was the only way to get to see this part of the world. Food is an important medium for connecting. When I was in Standard 4, at about 10 years of age, we did a study – The Manyatta of Kenya. I’m 46 years old. In ‘my day’ very few people travelled internationally. I remember one friend whose entire family went to Disneyland and they brought back a huge (and I mean huge) Winnie the Pooh. Another friend went to The Netherlands. But that was about it. I remember the same year that a plane full of tourists from New Zealand flew to Antarctica and them all perishing on a mountain there. 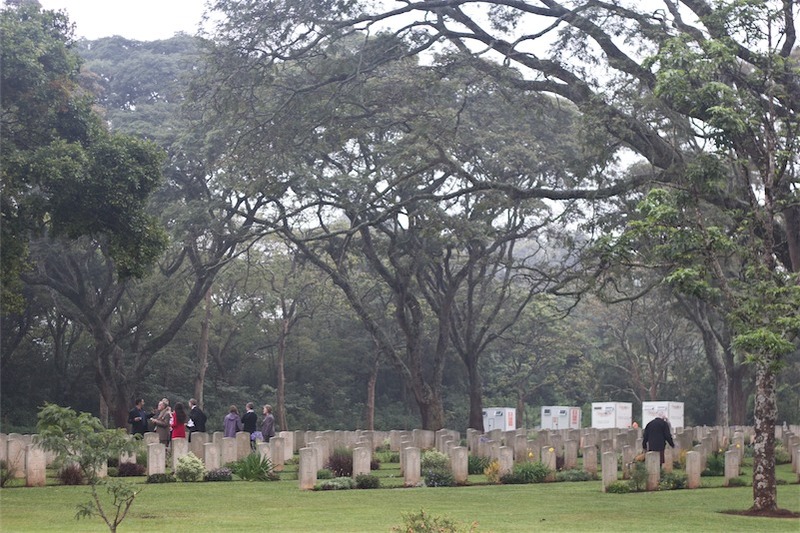 The War Cemetery is one of the tidiest places in Nairobi. We didn’t own a car until we inherited money from a grandparent passing. I remember travelling out of town once or twice. Over my teens I had grown up reading adventures of people who had travelled through China, Africa, South America and India. But I’d never been there. At the top of Mt Kilimanjaro, Tanzania. The first time I travelled internationally was when Pete went to college in Australia for 3 months, so we packed up and headed for the Sunshine Coast. Our girls were 8 weeks and a year old, I was 22. A couple of years later we went to India for a few weeks, left the babies behind and had a blast. We would’ve been happy to move there but things didn’t pan out that way. As the years went by we hosted plenty of international development workers or missionaries, many who worked in Africa. We threw (not literally) our girls out of their beds for our visitors. The girls thought it was cool, they didn’t know any different. I home schooled them for 6 years and integrated a lot of history, country information and cultural teaching. You can’t come to Africa and be in a hurry. Then life took a turn. We moved to Sydney, Australia where we’d never been before. Set up a new life, and it was great. That was 2002. 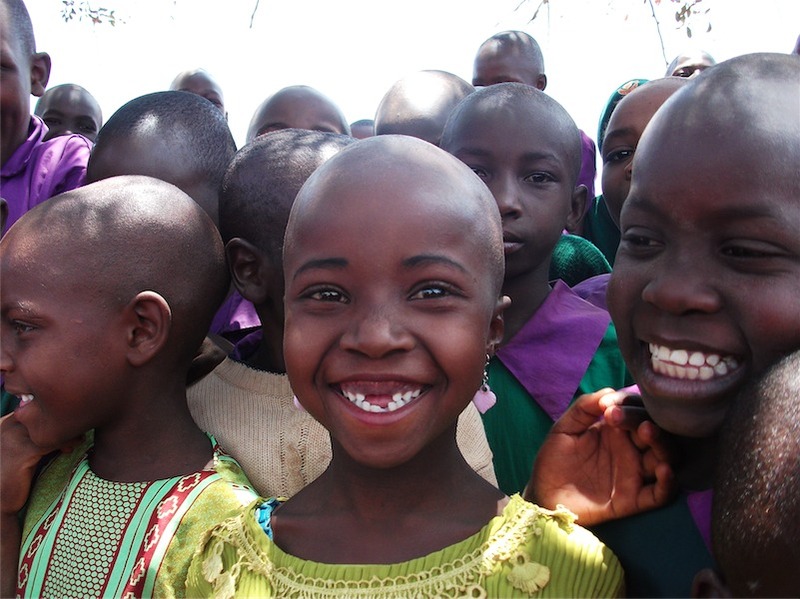 In 2007 I had the opportunity to travel to Kenya to graduate my students. I emailed a Kiwi friend of ours who we hadn’t seen for a few years and met up with them. It was great seeing their work with streetboys. I returned home for only a few weeks and then had to go to Ghana for a seminar. Ghana was so different to Kenya. East and West are like chalk and cheese. 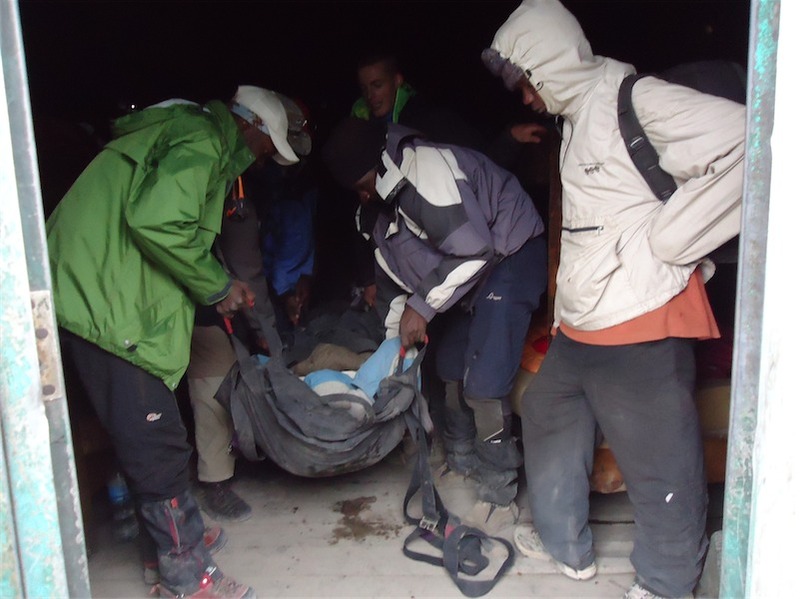 Pete being walked down Mt Kilimanjaro with a broken leg. In 2009 Pete and I decided that we wanted our girls to have a bigger world view. We wanted to show them that not all of the world was white, English speaking and middle class. So, we took them to Africa, specifically Kenya, Uganda, Rwanda and Tanzania. Our youngest daughter DID NOT want to go. She had just finished her last year at high school and decided she ‘wanted to work’ we told her she had the rest of her life to work, and she was coming. Pete was flown to Nairobi to receive top class medical care. For a year we saved, sacrificed and made budget. A couple of other young people came with us some of the way. It was a cheap trip – buses, backpackers and motorbikes. We had a blast (most of the time). After 8 weeks we returned home tired but changed. 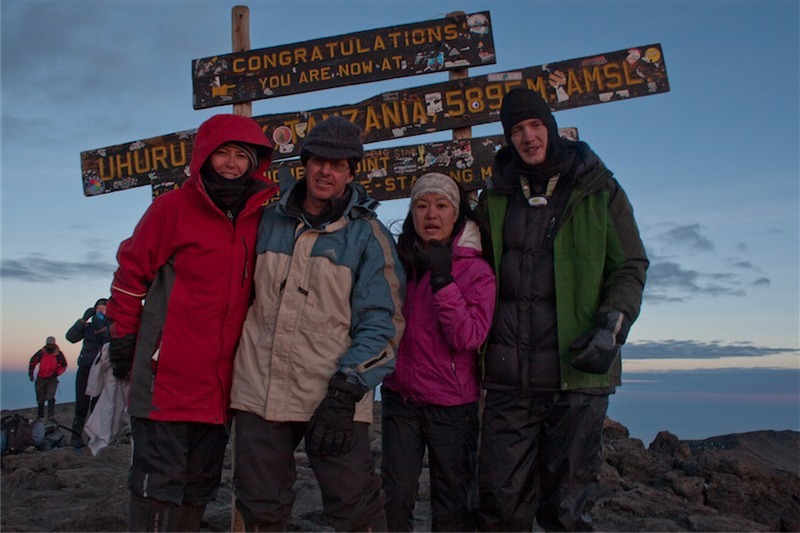 In 2011, Pete, Liz and I returned to Africa with the specific thought of ‘Could we really live here and what could we do?’ This time for another 2 months but it was to Kenya, Uganda and Tanzania (Climb Mount Kilimanjaro). 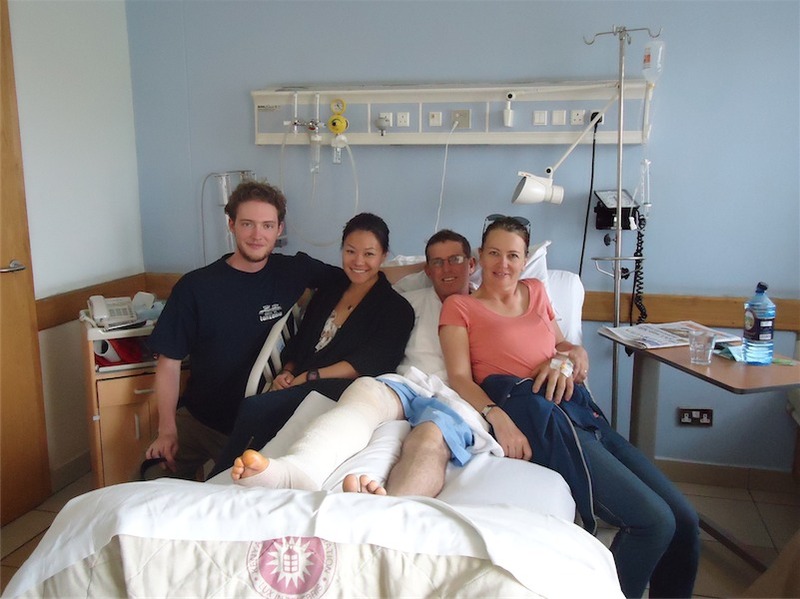 Pete broke his leg on the mountain, so he stayed back in Nairobi and Liz and I went throughout Uganda checking in on our projects. The change in plans gave us a longer time to see if Kenya would be our new home or not. 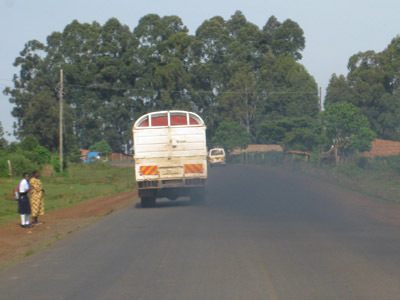 We’d travelled through lots of countries but there was something pulling us back to Kenya. 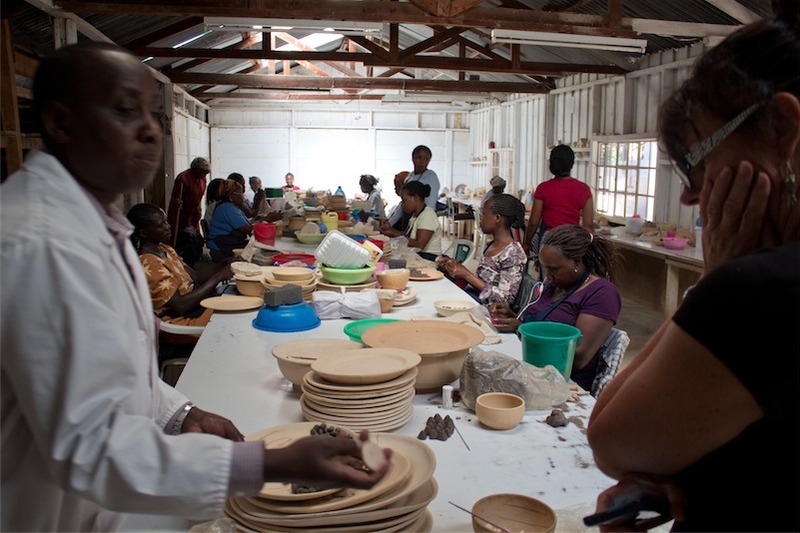 Nairobi is bustling with small businesses. Nairobi was the most modern city we visited. We had people we knew there. It could give us easy access to other countries. We liked it. We liked it enough that we moved in 2012. While there is lots of wildlife which is absolutely the coolest, it’s the amazing people that you get to meet. Those who struggle from day to day but keep a positive attitude. Those who are starting out in business and doing well. Expats who come here for some sort of experience. Nairobi is made up mainly of Kenyans but there are representatives from pretty much every nationality on earth. And so are the people. Kenya is never dull and boring. There’s always something to do and people to meet. There is a lot of history here (which I love). It’s diverse and interesting. You’re always learning something new. 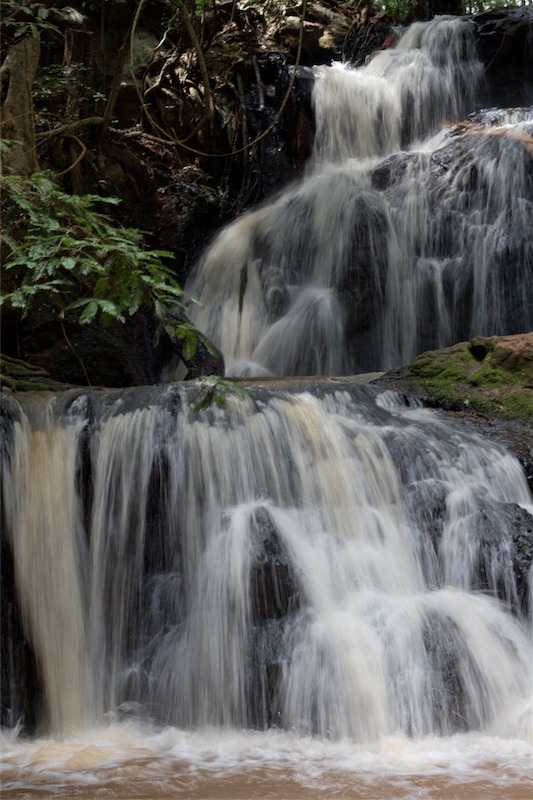 We’re close to our water projects and the communities we work with. We could’ve gone anywhere in the world and it we would’ve been fine but we chose Kenya. Actually, I think Kenya chose us.